Sixty-five years ago on Jan. 30, three bullets ended the life of the greatest pacifist of the modern era: Mohandas Karamchand "Mahatma" Gandhi. But his message lives on, and people around the world urgently need to heed it. Sixty-five years ago on Jan. 30, three bullets ended the life of the greatest pacifist of the modern era: Mohandas Karamchand “Mahatma” Gandhi. But his message lives on, and people around the world urgently need to heed it. The first people who should do so are those from the subcontinent where Gandhi lived. Clashes between India and Pakistan over the past month have killed a number of soldiers (including an Indian service member reportedly beheaded), raising temperatures in the region. 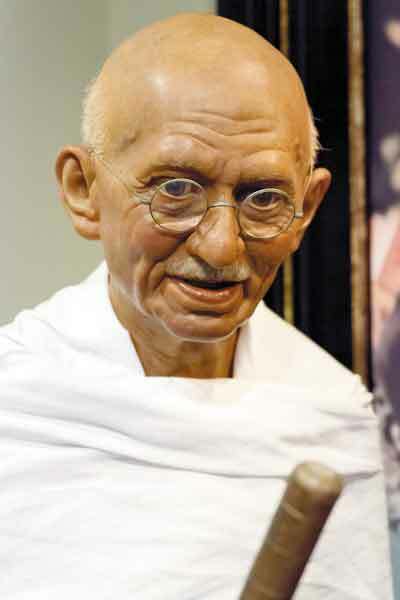 In his final months, Gandhi expended a lot of effort to foster peace between the two countries. When he was killed, he was planning to go to Pakistan to reconcile the new nations. He went so far as to say that he wanted to live both in India and Pakistan, and both were his homelands. What makes an India-Pakistan confrontation scary is the nuclear arsenals they have openly possessed since 1998. Gandhi was horrified by the atomic bombing of Hiroshima and warned, “Unless now the world adopts nonviolence, it will spell certain suicide for humanity.” All nuclear-armed nations (including the United States) would do well to abide by his message. Gandhi’s interpretation of Islam is also relevant today for those extremist groups that have distorted their religion’s teachings. Gandhi knew what he was talking about. He had studied the religion and its early history closely, and often cited Islam’s prophet, Muhammad, and his martyred grandsons, Hasan and Hussein, as inspirations. Gandhi, incidentally, was assassinated by a Hindu nationalist for supposedly being too pro-Muslim. Gandhi had astute insights for followers of other religions, too. He appreciated Christianity, especially its teachings about helping the poor and turning the other cheek. “I saw that the Sermon on the Mount was the whole of Christianity for one who wanted to live a Christian life,” he said. “It is that sermon that has endeared Jesus to me.” But he also cautioned that, while Christians say they give all glory to God and believe in peace on Earth, “there seems to be neither glory to God or peace on Earth” at the moment. And he had words of wisdom for the most powerful country on the planet. “Your land is owned by a few capitalist owners,” Gandhi said to an American. “These large holdings cannot be sustained except by violence, veiled if not open. … Your wars will never ensure safety for democracy.” Till his final breath, Gandhi was unwavering in his belief in the power of pacifism. “During my half-century of experience, I have not yet come across a situation when I had to say that I was helpless, that I had no remedy in terms of nonviolence,” he remarked toward the end of his life. This was matched by a deep faith in the capacities of ordinary people. “All mankind in essence are alike,” Gandhi remarked. “What is, therefore, possible for me is possible for everyone.” And he urged us all to take care of those less fortunate than us. “Recall the face of the poorest and the weakest man whom you may have seen, and ask yourself, if the step you contemplate is going to be of any use to him,” he said. Gandhi’s wise advice and profound commitments should guide us still, even six and a half decades after this remarkable man died. We honor him and ourselves by following his path. Amitabh Pal, managing editor of The Progressive and co-editor of Progressive Media Project, is author of the recent book “‘Islam’ Means Peace: Understanding the Muslim Principle of Nonviolence Today.” Email: pmpr [email protected] This article was distributed by MCT Information Services.